Sarah Palin is set to campaign with Texas Gov. Rick Perry this weekend. (CNN) - Sarah Palin is criticizing a Rick Perry campaign adviser accused of using the word "retarded" - but she isn't demanding that the aide be fired. The accusation - made against top Perry consultant David Carney on Wednesday by Kay Bailey Hutchison's gubernatorial campaign - is of note because Palin is heading to Texas this weekend to campaign for Perry as he seeks a third term as Texas governor. On Monday, Palin called on President Obama to fire his Chief of Staff Rahm Emanuel for using the very same word in a closed door meeting about health care negotiations. Hutchison's campaign manager Terry Sullivan told CNN Wednesday that Carney repeatedly said "retarded" during a recent conference call between the gubernatorial campaigns to plan logistics for their Jan. 14 debate in Denton. According to Sullivan, Carney became "bombastic and agitated" when he learned that one of the candidate holding rooms would be in a separate building from the debate venue. "That's just retarded," Carney said when he learned about the room location, according to Sullivan. "That's the most retarded thing I've ever heard." Perry's campaign did not respond to a request to comment on the conference call. Palin spokesman Meg Stapleton condemned the language as "disrespectful," but did not say that Carney should lose his job. "While it seems few can comment on the veracity of the conversation, Gov. Palin believes crude and demeaning name calling at the expense of others is disrespectful," Stapleton told CNN in an e-mail. Palin, whose youngest son Trig has Down Syndrome, wrote on her Facebook page Monday that the word "retarded" is "a slur on all God's children with cognitive and developmental disabilities." She said Emanuel's use of the term, first reported in a Wall Street Journal article last week, was "heartbreaking" and merited his dismissal from the president's inner circle. If we can ban the word "socialist" along with the “n-word” and the “r-word”, the Republicans won’t have anything to call our President. Maybe we can make the use of these words “hate crimes” so we can double the penalty for what we believe the perpetrators were thinking. Can we bring back public executions? (I would have said public hangings, but that might be interpreted as racist.) It is so hard to be an enlightened and politically correct elitist. This is double standard. Why is Palin saying that when one person should be fired from using this word who happens to be a Democrat, but has not shared that same feeling towards another person who use the same word who is a Republican? Sarah needs to be fair if she wants people to see her as a fair person. Shame on you Sarah. I can understand Mrs. Palin feelings toward the use of the word having a child with down syndrome. However, I do not see any reason to punish Emmanuel nor Carney for the use of the word. We all have used the word at some point in our lives. I know that when I did it was not related at all to those who suffer from mental or physical illnesses. Look up the definition of retard it states that retarded is slow or limited in intellectual or emotional development or academic progress. So, if this is the definition of retarded then both Emmanuel and Carney may be correct in their statements. Someone please buy this woman a dictionary! Just because she has a handicapped child does not excuse her ignorance of the English language. Retarded means impeded, slowed down, delayed. It can mean slow-witted – having nothing whatsoever to do with being handicapped. Some people, who are not mentally handicapped at all, can be intentionally obtuse. Perhaps that describes Ms. Palin in this case. 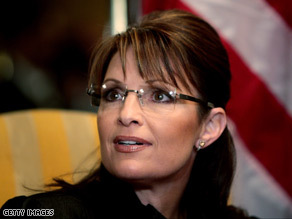 Media is making a mountain out of a mole hill as far as Ms. Palin is concerned. Thanks for wasting everyone's time. I hope you guys are getting the ratings you wish. Palin is a two faced, ego maniac with an inferiority complex. I wish she would just go away. She is an absolute disgrace to the female race! The "R" word is like saying "crazy" and is no more offensive offensive to use than crazy is regarding people with a mental illness. Seeing as how most people are in some way both the "r" word and on medication for mental unbalance... it's hardly a slam to one single group. Both the r word and crazy are a description that fits the majority.. some more than others but all to a degree. And i find it stupid that CNN has made me have to say the "r word". Give me a break. Of course he shouldn't lose his job – he NORMALLY has morals, unlike liberals and democrats. This is proven because he's a republican. No double standards here. Really? Is anyone surprised?! Pathetic, that this woman, and any of the vile, venom that spews forth from her forked tongue, is still news! Hypocrisy at its finest! Oh Sarah, having to hear your voice and what you say is Crude and disrespectful! The word "retarded" is like saying "crazy" and "retarded" is no more offensive to use as an adjustive than "crazy", in terms of being emotionally sensitive to people with a mental illness. Seeing as how most people are in some way both "retarded" and on medication for mental unbalance... it's hardly a slam to one single group to use either. Both the words retarded and crazy are a description that fits the majority on our planet.. some more than others, but all to a degree. Typical political hypocrisy by Sarah Palin. She calls for Rahm Emmanuel to be fired for using the word "retarded" but doesn't call for Carney's firing. Why? Well, because he is a Republican, of course, and works for another Republican that she likes and supports. Politicians are hypocritical grandstanders, and Sarah Palin leads the pack. It is amazing anyone gives any credibility to anything they say. What has happened to free speech? Control freaks typically tyrannically pick at every statement, every thought, and every word. Please? As voters, we need to be as responsible as we want our officials to be. The Republican administrations have a track record of recessions and failed economies. In no way have the Republicans been vindicated for the last administration. They pick at a word to distract US. Those who do not learn from the past are destined to re-live it. Don't turn your trusting backs on yappy dogs-man's best friend unless you like getting bit. Be mindful, two oilmen were in the top executive positions of this USA and we got chunks bit out of US every time we needed fuel. Sara sure is pretty! She walked off her job to do what? Don't use the "R" word! Republicans, Recessions, Retard, Repossessed Homes, Re-vote Republican Recessions.Talk the talk but Re-vote to Re-live the past. Retry Re-intelligence. Remind the Re-voters.